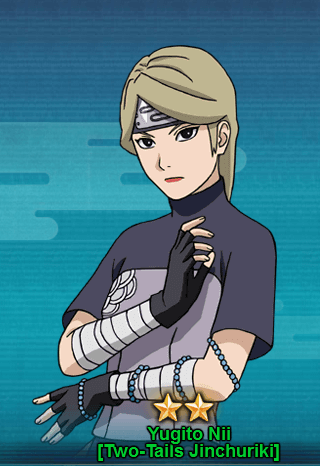 Yugito Nii is the Two-Tails Jincuriki and also a Jonin from Village Hidden by Clouds which led by Raikage. She has the ability to control her tail beast transformation. During a pursuit by the Akatsuki, she was defeated by Hidan and Two Tails were extracted from Yugito Nii [Two-Tails Jinchuriki] which led to her death. During the Fourth Shinobi World War she was reincarnated along with other jinchurikis. Taijutsu, Ninjutsu Cat-Fire’s Bell [Prompt]: Causes Fire attribute damage to the opponent’s entire team and Ignition. The selected unit will suffer from High Float. Ninjutsu Cat-Fire: Attacks the opponent’s units in the front row and has a high chances of causing 10 COMBO. Taijutsu Wrong Hand Mistake: Triggered with at least 20 COMBO, attacks 4 of the opponent’s units and will cause the units to suffer from 5 COMBO. Ninjutsu Tailed Beast Chakra – Self-Healing: Before the first action in a round, recovers Life points based on this unit’s Ninjutsu attribute. Can be triggered twice each round. Ninjutsu 9 Lives: If this unit is defeated, it will be resurrect 2 rounds later with 30% of its original Life points. You can get Yugito Nii [Two-Tails Jinchuriki] from the Jinchuriki Treasure 1. It will take almost 10 seal scrolls draw to get Yugito Nii.